Economists increasingly recognise that engagement with social ontology – the study of the basic subject matter and constitution of social reality - can facilitate more relevant analysis. This growing recognition amongst economists of the importance of social ontology is due very considerably to the work of members of the Cambridge Social Ontology Group. This volume brings together important papers by members of this group, some previously unpublished, in a collection that reveals the breadth and vitality of this Cambridge project. It provides a brilliant introduction to the central themes explored, perspectives sustained, insights achieved and how the project is moving forward. An initial set of papers examine how ontology is understood and justified within this Cambridge project and consider how it compares with prominent historical and contemporary alternatives. The majority of the included papers involve social ontological analysis being put to work directly in underlabouring for specific types of development in economics. The papers are grouped according to their contribution to clarifying and developing (i) various competing traditions and projects of modern economics, (ii) history of thought contributions, (iii) methodological concerns, (iv) ethics and (v) conceptions of particular aspects of social reality, including money, gender, technology and institutions. Background to and a brief history of the Cambridge group is provided in the Introduction. 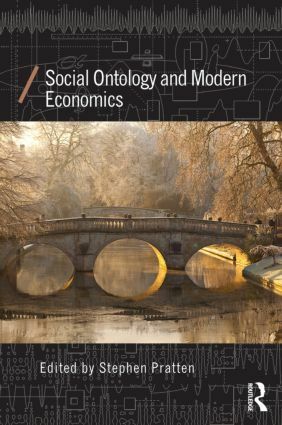 Social Ontology and Modern Economics will be of interest not only to economists but also philosophers of social science, social theorists and those eager to explore the nature of gender, social institutions and technology.